Home-Business-Wealth.com Reviews - Legit or Scam? 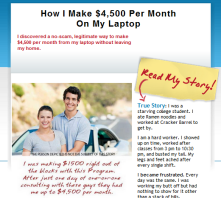 Home-Business-Wealth.com Reviews – Legit or Scam? Home Business Wealth says that, with just a couple of hours an evening over the course of three months, you can earn up to $4,500 a month using this proven system for earning money online. The system, the Six Figure Program offered by Ben Moskel and Dave Clabeaux, is an affiliate marketing training program which teaches its members how to earn money by posting links online for other companies. Affiliate marketing, and especially link posting opportunities, is one of the fastest growing online industries today, and one that many people successfully use to earn a living. Unfortunately, this opportunity is often misrepresented by those who earn money either advertising a program, like Home-Business-Wealth.com, and those selling a program, like the Six Figure Program. In affiliate marketing, you would place links online for partner companies advertising either their goods or services. When your link resulted in a sale for that company, you would be paid a commission. But like any independent business opportunity, an affiliate marketing business often takes a lot of time and effort to get off the ground successfully. Before investing in any job training program, it’s always a good idea to look at the free information available online to see if that opportunity is right for you.